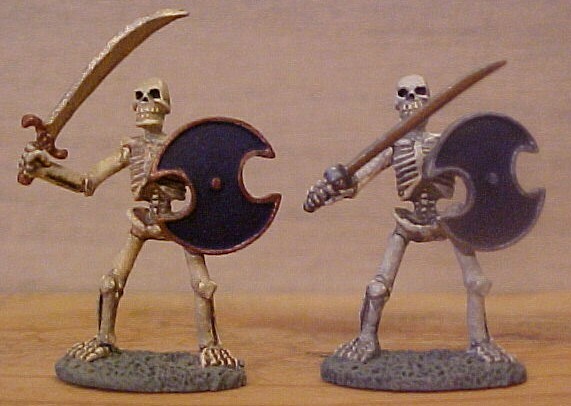 After seeing so many skeletons on the sight painted white, I decided to take pen in hand and write a brief article on a slightly different technique that gives in my opinion a slightly better result and a more realistic look to said undead. 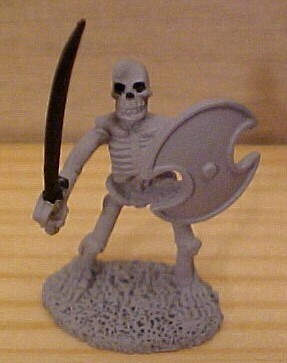 Ok, I was also looking for another excuse to buy new minis. Now, having said that let me briefly diverge and explain why I feel qualified to write this article. I have a Bachelors Degree in Anthropology, specializing in Physical Anthropology, and spent over ten years in the fire service, as well as two years doing human remains recovery. One of the biggest misconceptions about bone is that it is white. 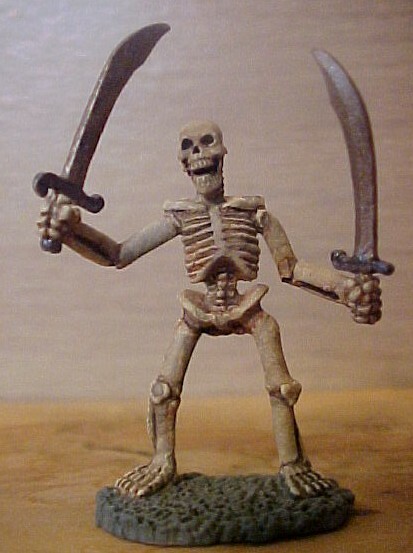 Most of us have seen a skeleton at one time or another, either in classes or at the local museum, and by and large these skeletons are white or off white in coloration. Most of those bones have been boiled, and this bleaches the bone to a white color. Bone that has lain in the ground with a body of some sort decomposing around it is not white. Bone is a rigid semi porous material that takes on coloration from the materials around it. Fresh bone is almost ivory in color, and bone that has lain in the ground for any length of time absorbs minerals from ground water, causing it to take on the color of the soil around it (this process is known as ground staining). Bone will bleach, if exposed to the sun on the surface for long periods of time, but this process also weakens the bone. So, on to the painting. 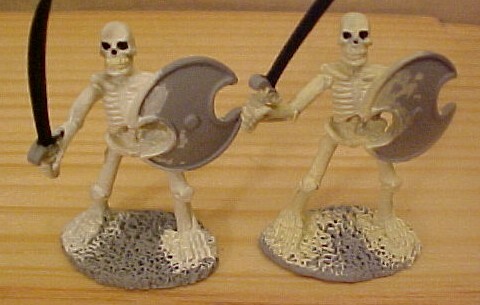 First, I prep and prime the miniatures like I would for any other paint job. As you can see from figure one, the figure has been primed and a little pre-painting of the eye and nose sockets, as well as the sword has been done in black. I prefer to paint the eye sockets black and leave them that way, and am experimenting with a new technique on the sword as well. As an aside, any step that would be the same for all minis will be represented by one mini, while side-by-side comparison shots of different techniques will show the different steps used. After pre-painting all the dark colors on the mini, the next step is to decide what color to use as a base coat. 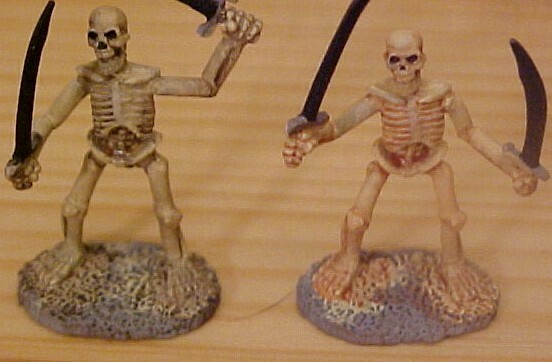 On these minis I started with two different base colors, Antique Ivory and Ivory, both from Delta Paints. The side-by-side shot (fig 2) will give you some idea of the difference in the two colors. The Ivory is the lighter figure on the left, and the Antique Ivory on the right. Both colors are off white and take staining from washes well. Step three is to pick the base staining color. For the lighter colored miniatures, I chose Burnt Umber, and for the darker I chose Burnt Sienna (and for the fifth mini in the pack, first I washed with Burnt Umber, then with Burnt Sienna, just for the hell of it). Both colors were thinned to a wash, and then applied liberally to the miniature in question with a large brush. Usually, I will allow the wash to pool in some areas of the miniature to give darker coloration to those areas (fig 3). This gives the lighter miniatures more coloration, as well as knocking some of the yellow out of the darker miniatures. Next, I picked out the teeth on the lighter miniatures in the darker ivory, here again because I prefer that color for teeth. Then, I prepared to do the ground staining on the miniatures. As I said before, ground staining is the result of the bones laying in the ground and leeching in minerals from the surrounding soil. Here another level of personal choice came into play. I live in Austin Texas, at the bottom of what is referred to as the Blackland Prairie Belt in Texas. The soil around here is black as sin, except where the sun has bleached it to a light gray and is the color and consistency of concrete and about as easy to dig through. 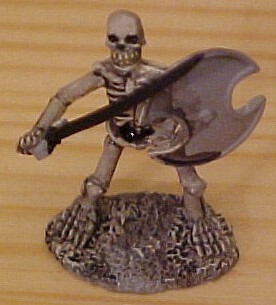 Because of this, I chose to do the final staining of the miniatures in a black wash, to make them appear as though they had been raised from the dead around here, and because I am planning to use them in a modern horror campaign set in the Austin area. So here again, the paint was thinned to a wash consistency (about three large brush fulls of water to one drop of paint) and applied liberally (fig 4). So, I hope this helps.